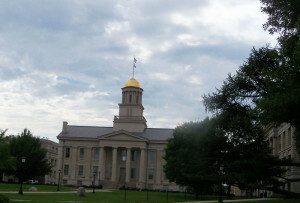 The Old Capitol on the University of Iowa campus. Governor Branstad says he’s disappointed faculty at his alma mater have called for the ouster of the entire board that governs the University of Iowa. “I was kind of shocked that the College of Liberal Arts and Sciences, of which I am a graduate, would advocate for something that I clearly don’t have the authority to do,” Branstad said today. Faculty groups in Iowa City have been expressing displeasure with the hiring of Bruce Harreld as the next president of the University of Iowa. The College of Liberal Arts and Sciences last last month called on the entire nine-member board that hired Harreld to resign or be forced out by the governor. Branstad has said he doesn’t have legal standing to take that action. “They do not serve at the pleasure of the governor, so I do not have the authority to just dismiss them,” Branstad said today. The nine members of the Board of Regents are appointed by the governor, but have to win the support of at least 32 state senators in a confirmation vote to serve on the panel. Branstad has said University of Iowa faculty need to “calm down” and give the new president a chance. Harreld is scheduled to start on November 2.